1) Note: We have various documents regarding land transactions by Matthias Andis (Matthias Shutters's grandfather) and his heirs. They include purchase, sale and distribution of land in Washington Co, VA. These are very important documents to our research, as they conclusively tie Matthias, his children, and his grandchildren together. 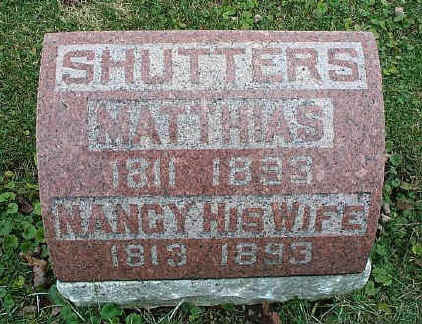 2) Wife of Matthias Shutters: Nancy Thomas - born 30 Sep 1813 CT or NY; died 31 Mar 1893 Alto, Howard, IN; obituary; buried Crown Point Cemetery, Kokomo, Howard, IN - see tombstone photo below; daughter of Jonathan Thomas. 3) We have historical references to the Shutters family. 4) We have maps showing Matthias's land ownership. 5) We have an obituary for Matthias. He died only 4 days after his wife Nancy. 6) Matthias and Nancy are mentioned in pension papers filed by Marshall Shutters.